Enhance unit and force morale, recruitment, retention and public esteem. Help develop the characteristics of leadership, teamwork, confidence, initiative, self-discipline and judgment of their individual members. The citations for the 2016 Prince of Wales’s Awards for Best Expeditions and those worthy of specific mention are as follows. A number of interesting expeditions were undertaken by the Volunteer Reserve which broke the tried and tested formulaic trips of previous years. Although Reserves were integral to a number of demanding regular-led expeditions, these have been excluded due to the small numbers of Reserve participants and that the trips were planned and led by regulars. Of the expeditions considered, Exercise NORTHERN BACKCOUNTRY SAPPER undertaken by 39 and 71 Engineer Regiment was highlighted as a challenging ski touring expedition in the Banff National Park, Canada. Also of particular note was Exercise DHAULAGIRI SERPENT led by 201 (Northern) Field Hospital, a 30 day trekking and medical research expedition in Nepal as part of the British Services Dhaulagiri Medical Research Expedition. 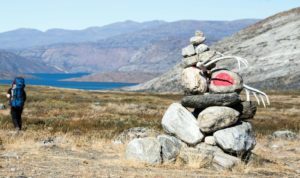 In reviewing all of 2016’s Volunteer Reserve expeditions it was felt that 3 Royal Welsh’s Exercise DRAGON SISIMIUT, a trekking expedition to the west coast of Greenland was a worth recipient of the 2016 Award. 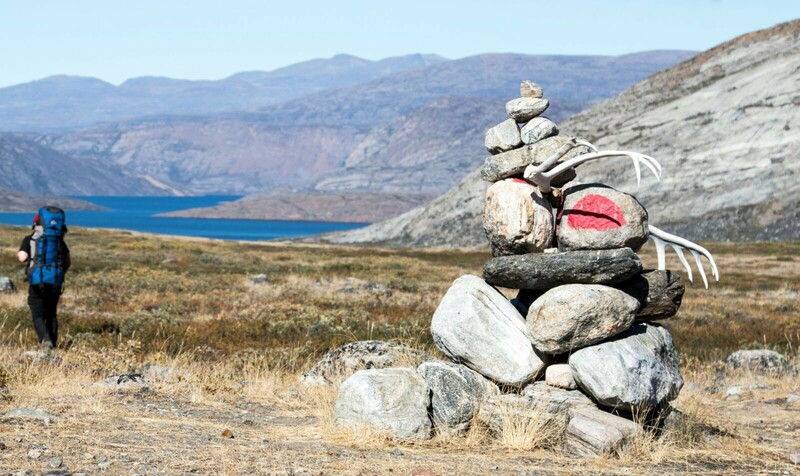 During the Summer of 2016, 14 members from 3 Royal Welsh undertook Exercise DRAGON SISIMIUT, a 9 day, 165km unsupported trek along the Arctic Circle Trail on the west coast of Greenland. As a Reserve infantry unit, the unsupported physically demanding nature of the expedition ticked many boxes with respect to challenge and adventurous training. Starting clean shaven and fresh looking, with bergans weighing around 22kg the team was blessed with sunshine and fine weather which in some ways made things easy but in others, more challenging; water management and personal hydration required continual attention and the individuals learnt much from these challenges. Map reading using 1:100k maps and interpretation of the local topography was also a new skill that which had to be mastered especially as there were no manmade objects to assist with navigation. The group learnt quickly also, to keep bergan weights manageable, that anything that did not have a specific function had to be left behind – personal judgement was required when it came to making equipment decisions. Food management was also a challenge as only just enough was taken to ensure that weight was kept to a minimum. Everyone had been given clear guidance on nutrition and the balance to be struck between calorific value and weight and then allowed free rein with their personal food purchases. To supplement the food, the expedition had taken equipment to fish and were lucky to catch many Arctic Char in rivers, sizable cod from the sea and collect green lipped mussels from coastal areas. The char were caught from the rivers by various means; rod and line, mosquito head net and also by hand. All these fish were cooked on open fires in foil and eaten with relish. By the time the expedition reached the end of the trail the members were sun-tanned, grubby, smelly, fitter but also trail hardened. They had all learnt much about teamwork, self-reliance, personal administration and navigation during the 9-day traverse and consequently the expedition achieved its aims admirably. This was a very special opportunity for Reserve soldiers to undertake challenging adventurous training in a unique setting. However, it was felt that Northumbrian University Officer Training Corps Exercise NORTHERN BEAR, a trekking expedition to the Sierra Nevada Mountains of California was 2016’s winning University expedition. 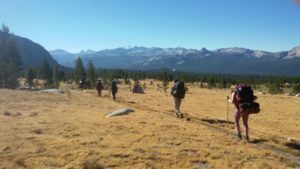 Exercise NORTHERN BEAR was a 9-day summer mountaineering to the Sierra Nevada Mountains in Yosemite National Park, California, USA. A group of 23 Officer cadets, subalterns and army mountaineering instructors undertook the trek, with 11 of the participants gaining the Summer Mountaineering Foundation qualification. The 3 sub groups, limited to no more than 9 per group by the Park Rangers, planned their own routes, covering between 6 and 14 miles a day, at times at an elevation of over 3000m. Although expedition was in early-September, when the temperature was lower but before the Park closes in late-September, the temperatures were still high in lower valleys which made carrying bergans very arduous and so some of the groups decided to enjoy lengthened lunch breaks (and often a swim) along with regular water stops to guard against heat injuries. Although to save weight one group chose not to use tents and sleep under the stars in bivi bags every night! Although prepared for challenging weather conditions, the expedition was blessed with sunshine for all but one day when it snowed. The remoteness of the routes added an extra dimension to the trip. Satellite phones were carried as an emergency precaution as normal mobile phones got no signal at all. Without the satellite phones the only other option would have been to seek help by running, in some locations, for 1-2 days to the nearest camp site! This played a major factor in the cadet group leaders daily dynamic risk assessment. One of the other key safety factors involved in the daily route selection was the availability of running water, and plans had to be confirmed or altered during the trek as the occasional walker told the groups whether streams shown on the map were still running or had become dry. The expedition was also lucky enough to see larger animals including brown bears, racoons, marmots and deer, and quite a few snakes! Yosemite is home to a large population of Brown Bears, which (in general) are not aggressive to humans but food/wash kit/sun cream has always to be in bear canisters that are stored away from the camp site at night teaching the cadets a valuable lesson in both personal and group administration. During 2016 there were excellent expeditions undertaken by cadets making the selection of the best cadet expedition very difficult. Expeditions worthy of mention include Loretto School Combined Cadet Force who undertook a cross-country ski expedition following in the footsteps of the Norwegian saboteurs on Op GROUSE. Gloucestershire Army Cadet Force undertook Exercise VENTURER SPIRIT in Germany and Austria introducing the cadets to Alpine mountaineering, which included summiting both Germany’s and Austria’s highest mountains, the Zugspitze (2962m) and the Grossglockner (3798m). Budmouth College Combined Cadet Force ventured further away with their MOONLANDS expedition, which saw the cadets spend 5 weeks in the Ladakh region of the Tibetan Plateau. This multi activity expedition saw the cadets tested in an isolated and demanding environment, as one Cadet reflected ‘I found the whole expedition incredibly demanding and for me this has been an impressive achievement of which I am extremely proud. It has given me a much more positive outlook and has made me more appreciative of my very privileged life. I now feel a much stronger moral duty to improve the life of others.’ An excellent expedition from a grant-maintained school in one of poorest parts of the country, and supported in alliance with the Connaught Trust. 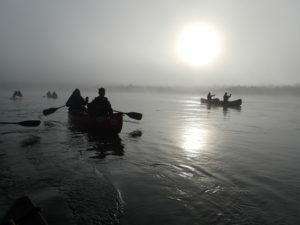 But in reviewing all of the Cadet expeditions undertaken this year, one expedition clearly shone and demonstrated the benefits of undertaking adventurous training, showing that it is not only the actual expedition where learning and personal growth occurs but throughout the entire process of the expedition; from its very inception to the honest reflection on completion. Exercise YUKON ADVENTURE 2016 – Sussex Air Cadet Wing. Exercise YUKON ADVENTURE was a demanding expedition which saw 8 cadets and 4 staff from the Sussex Air Cadet Wing, spend 10 days canoeing 369km down the Yukon. This self-sufficient paddle was 2 years in the planning, trained for over a 12 month training period and with fundraising undertaken by the cadets which helped to teach them the importance of budgets. The themes of the expedition were both educational as well as physical, in an environment that allowed the members to develop their skills of communication, leadership, teamwork and self-confidence. The demanding and unique nature of the expedition and the work which was undertaken by both the cadets and staff makes it an extremely worthy recipient of this year’s Award.